Akoustis® (http://www.akoustis.com) is a high-tech BAW RF filter solutions company that is pioneering next-generation materials science to address the market requirements for improved RF filters - targeting higher bandwidth, higher operating frequencies and higher output power compared to incumbent polycrystalline BAW technology deployed today. The Company utilizes its proprietary XBAW single-crystal BAW manufacturing process to produce bulk acoustic wave RF filters for mobile and other wireless markets, which facilitate signal acquisition and accelerate band performance between the antenna and digital back end. Superior performance is driven by the significant advances of high-purity, single crystal piezoelectric materials and the resonator-filter process technology which drives electro-mechanical coupling and translates to wide filter bandwidth. The Company plans to service the fast growing multi-billion-dollar market of device OEMs, network providers, and consumers to diminish front end phone heat, battery drain and signal loss -- all considered to be directly related to current RF polycrystalline filter technologies' limitations. The Company owns and operates a 120,000 sq. ft. ISO-9001 certified commercial wafer-manufacturing facility located in Canandaigua, NY, which includes a class 100 / class 1000 cleanroom facility - tooled for 150-mm diameter wafers - for the design, development, fabrication and packaging of RF filters, MEMS and other semiconductor devices. 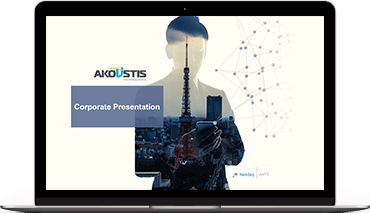 Akoustis Technologies, Inc. is headquartered in the Piedmont technology corridor near Charlotte, North Carolina.